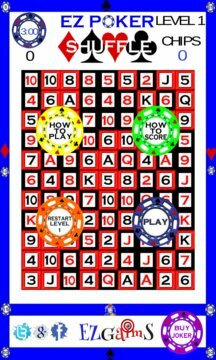 EZ Poker is a captivating matching game based on its classic counterpart. Featuring a combination of game styles, this game is different from all the rest. game very fun and exciting, as well as the wild joker cards. You have 3 minutes to get the highest score you can. You must reach 100 points to go to next level. EZ Poker features high quality graphics and smooth game play. 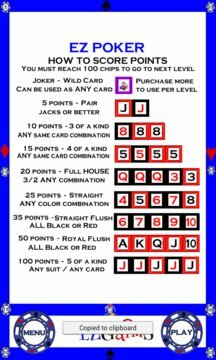 It's a fun way to pass the time and an easy way to learn poker. EZ Poker is the perfect addition to your mobile gaming library. Play this sensational game from EZGaimS App Developing Company today.